Over the last few blogs I have outlined some of the productivity challenges that the FinFET process brings with respect to custom layout. Today Synopsys unveiled Custom Compiler and ushered in a new era of visually-assisted automation. 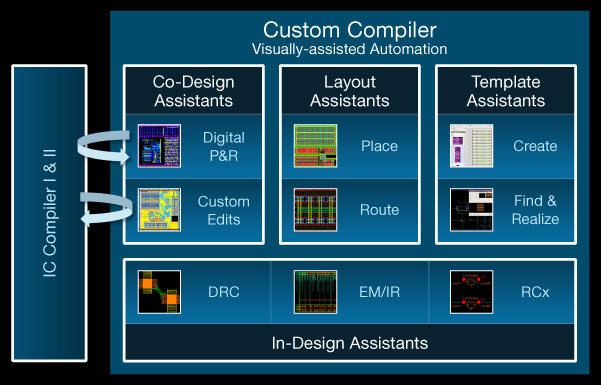 Custom Compiler has all the good stuff I’ve been saying is needed in earlier posts: a new custom design solution that closes the FinFET productivity gap by shortening custom design tasks from days to hours. This is not a revamp of the old constraint-based legacy approach, it’s a fresh approach to custom design that employs visually-assisted automation technologies to speed up common design tasks, reduce iterations and enable reuse. What’s visually-assisted automation, you may ask?